Presumption is destructive. It is a lead weight that carries us to the bottom of the ocean. On the other hand, faith is vital. On the wings of faith we can soar to new heights. Without it we cannot please God at all. Many times these two different belief systems can say the same things and do the same actions, only the results are different. 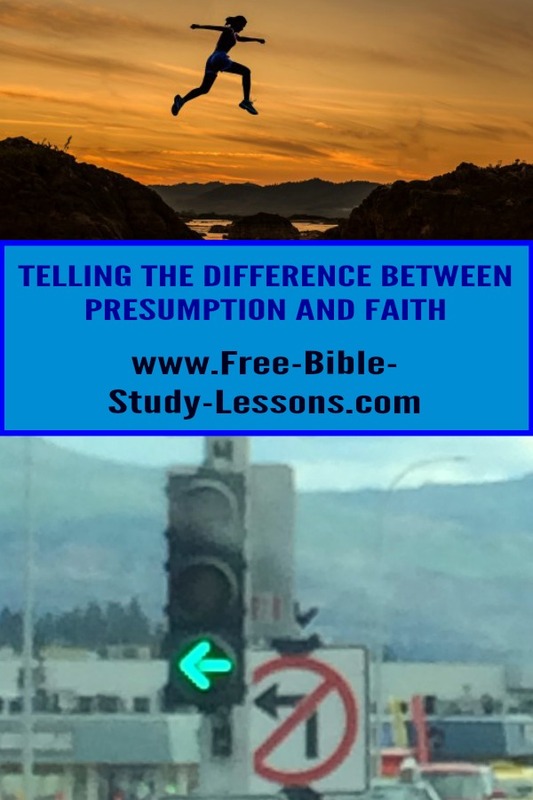 How can we tell the difference between faith and presumption? In its essence, faith is simply trusting God. It is being willing to believe God and His Word even if the outward circumstances appear to contradict it. It is knowing that God is good even when only bad things seem to be happening to us. Job is, of course, the prime example of this. He lost everything from his wealth to his family to his health, yet he still clung to God. Part of the devil's tricks is to get us to put faith in what we see and feel rather than in the Word and character of the Lord Jesus Christ. Believing and acting on a general faith in God is where things start, but faith is personal. God has given many promises in His Word. Faith takes those promises and begins to live them out. There are two aspect to this. First of all, faith seeks to obey the Word of God because it trusts the God Who gave it. It knows that obedience is an act of love and devotion. Faith knows that it many not see the results immediately - if it did, faith would not be necessary. And so the person of faith continues to align his or her life with the Word of God in love whether or not they see any immediate personal benefits. For example, the husband whose wife is on the point of divorcing him and turns to God in repentance of his sins will, in faith, continue to follow God even if he ends up losing his wife and family. Second, when God makes a promise in His Word real to the individual heart of a believer, the person of faith will act on it even if it seems foolish. In fact, it probably will seem foolish to the natural eyes. This is where it becomes vital to hear what God is actually saying individually and not to hear simply what we want God to say. If God has made a promise real in our hearts then we know God will follow through and we can stand confidently in the face of opposition because we "know" God has spoken to us in that area. We may not be able to explain to family or friends how we know - and they may think we are crazy - but we know God has spoken to us. And that is enough. An example of this would be a person who leaves a well-paying job to start a new church. From a human perspective this is a very foolish and risky thing to do and finances may be tight to non-existent, but if the person knows in faith it is what God has called him to do, he can launch out knowing that God's arms are under him and he will accomplish the will of God. Presumption is trying to force God to do our will. Jesus was tempted to presumption when Satan told Him to jump off the pinnacle of the temple [Luke 4:1-13]. Satan even had Scripture to back him up. He was challenging Jesus to believe and act on the Word of God! How unScriptural would it be for Jesus to ignore what the Bible plainly said? Jesus didn't have to "prove" Scripture or defend His faith. Jesus knew that that Scripture wasn’t God’s will for His life at that time. For everything there is a time and a season. To have done something foolish and expected God to protect Him would have been the sin of presumption. In grace God may have protected Him or God may have allowed Him to suffer the consequences of His actions. Of course, we know that Jesus answered the devil with Scripture showing that the devil's Scripture-backed proposition was actually disobedience and sin. Presumption is attempting to manipulate God. It relies on the same principles as witchcraft. Witchcraft believes that it can manipulate the supernatural [angels, demons, spirits, etc] through the use of words [spells], rituals or potions. It is trying to control the spirit realm for personal or selfish purposes. Notice I did not say that when Christians fall into the sin of presumption they are practicing witchcraft. But what they are unconsciously doing is using the same principles that witchcraft is based on. Principles that a] are abhorrent to God and b] do not work. God will not be manipulated by our presumption of His love and grace. Some people have refused to take vital medicine or refused necessary operations claiming God would heal them. They have placed their lives [and in some cases the lives of their children] in danger. They have thought they were operating in faith. In fact, if they did not have a personal, direct Word of God, they were operating in presumption. They were trying, perhaps unconsciously, to force God to do their will instead of seeking for God’s will. Now, don’t misunderstand me, I believe in divine healing. But faith is believing God’s Word - having Him make it real to us - and waiting for His timing. My father, a former pastor, has told of a lady who he had to several times drive to emergency at a hospital because she stopped taking vital medicine in the belief that God had healed her. No one can doubt her sincerity. She was willing to risk her life on her belief. She knew and believed God's general will of healing, what she did not have, based on the results, was God specific word to her that He had healed her. She desperately wanted to be healed. Perhaps unconsciously she thought if she "proved" her faith by not taking her medicine, God would be forced to honour His Word and heal her. This is exactly the same temptation to presumption that Jesus faced on the top of the temple. God responds to faith, not to presumption. Another misconception about faith is that it is something we can work up in ourselves. Saying, “ I believe” a million times does not create faith only presumption. We can’t talk ourselves into it. Even memorizing and repeating Scripture [as good as that is] doesn’t create faith. Faith is a work of God, presumption is a work of man. Faith comes by hearing/studying the Word of God and having the Holy Spirit quicken it to our hearts. If we don’t have faith in a given situation we do not need to be condemned. We shouldn’t try humanistic/physiological tricks to work it up. We will only end up with presumption. We come to God and confess our lack of faith. We ask God to grant us His gift of faith and we study His Word. The fact that we are willing to honestly lay it all before God is itself an act of faith. And in faith we leave it in His hands. We have faith in God even when we can’t see our way through a given situation.